As there are a large range of applications for these outdoor event products, there has to be a range of hardware which allows the user maximum flexibility. 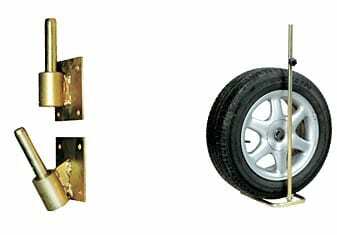 Additional hardware for making your banners freestanding on hard surfaces may be needed. Attaching an Ex-disc to a pole or putting a flying banner on a car forecourt can all be done, but some extras over what is supplied as standard are needed. Images of many of the types of extra hardware are shown to the right but if you are not sure what you need, give us a call and we will be happy to advise.